Last spring, my daughter and I set out to circle the globe on a 99-day journey, seeking people who were making a difference in the world. A little more than a year later, we have completed a feature documentary about ordinary people on six continents who have not only had a positive impact on others, but they have had life changing experiences themselves. 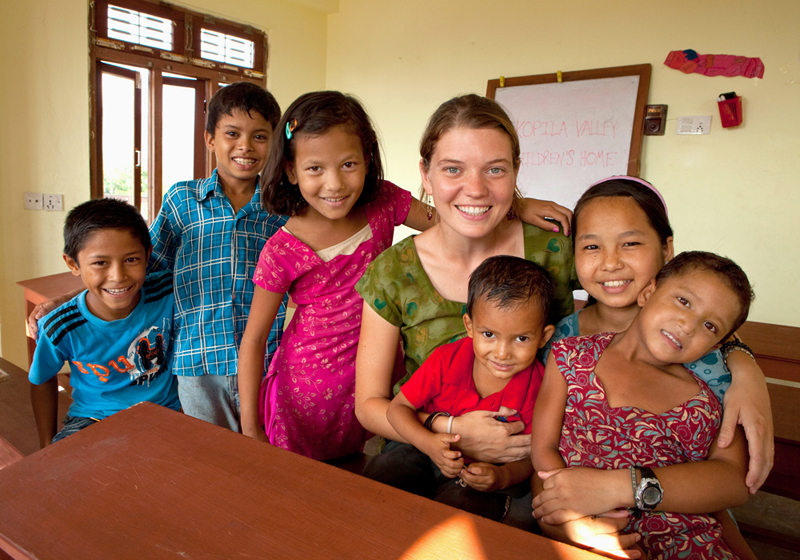 young woman that my daughter had gone to high school with, Maggie Doyne, At 19-years old, Maggie opted not to go straight off to college, but instead traveled on what was intended to be a gap year between high school and college. Five years later, at the age of 24, she has built a home in Nepal for 35 orphaned children, where she now resides and had recently finished construction on a primary school for 250 children when we visited her last summer..
Maggie has caught the attention of quite a few high profile people who have helped her in her mission. Last fall she appeared on the cover of the NY Times Magazine illustrating an article by Nicholas Kristof about DIY foreign aid. She’s a remarkable young woman. But what is often overlooked when one mentions Maggie’s accomplishments is that she herself, has changed her life’s path – before barely beginning. Maggie is just one of eleven people that appear in our film, Opening Our Eyes. As we traveled the world, my daughter and I quickly realized that all of these extraordinary people had one thing in common, beyond doing good for others. They all had disrupted their own lives and had shifted course. They had discovered their purpose and in the process, found their bliss. Maggie is fortunate that she made this discovery while she was still young. In a less dramatic way, I had my own awakening early in my career. In the late 70’s, I had just finished studying photography at Brooks Institute in Santa Barbara, California and I headed back East to pursue a career as a photojournalist. It was not the best of times to be starting out as a photojournalist, at least in terms of being able to make a decent living. So, I took a bit of a detour and pursued commercial photography instead. While making the rounds with my portfolio in NYC, I went to see legendary photographer Jay Maisel. Jay was known for his blunt demeanor, and when he looked at my perfectly presented photographic portfolio, he tossed it at me and told me it was garbage. He asked me if I had anything else to show him. I took out my dog-eared photos from my first world journey that I had taken before heading to Brooks. As he looked through my “snapshots” he asked me how old I was. I replied that I was 25 years old. He looked me straight in the eye and said, “You’re 25 and you’re already making compromises?” That was a turning point in my life and I never looked back from pursuing my passion. I suppose Maggie and I are lucky in that we discovered our purpose at such a young age. But in making this film I learned one important thing – it’s never too late to find your bliss. This entry was posted in People Making a Difference, Travel, Video and tagged around the world, Blinknow, children, community, daughter, discovery, documentary, exploration, extraordinary people, helping others, idea, inspiration, Maggie Doyne, People Making a Difference, responsibility, Travel, volunteers. Bookmark the permalink.